I was featured in the Annapolis arts quarterly publication Up.St.Art Magazine, (Winter 2017) with a lovely interview by Katherine Matuszak and photos from Mary Ella Jourdak. Link below. Call for Entires:: Now accepting 2d work for May 14 show at The Metropolitan Annapolis. Deadline April 18. 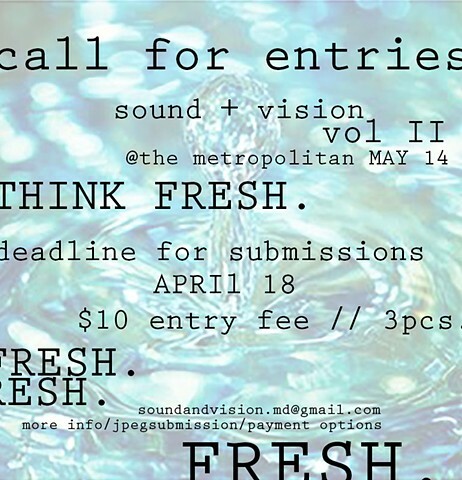 $10 submission // 3 pieces. An Americana conglomerate. 8 Maryland artists' contributions and highlights of iconic Americana culture, past and present. Brand new paintings featuring an overload of refracted light, and time spent under water. Thursday night August 13 at Tsunami! Come out, bring friends, have sushi and drinks! The music of Beck will be playing for the duration of the night. 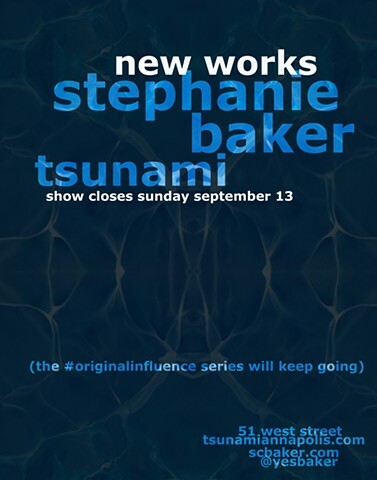 This show will be hanging until September 13. Group show, all women artists! My work will be up at La Bodega Gallery, 1501 Guilford Ave, Baltimore (A100). Opening is Tuesday January 13th, 7-10p. A closing party is happening on January 31, same time. Btw, I saw all of the work pre-hung tonight, it's going to be rad. I'm completely honored to have been a part of Jeff Huntington's wild vision of encapsulating a moment in Annapolis' art and cultural history. His grand task, painting 49 artists, painters, performers, photographers, musicians, makers, and visionaries who all have roots in Annapolis, Maryland. Each is a 16"x16" oil portrait in the style of an old master; rich, deep, and complete with old world essence. Additionally: 49 photographs of each artist, as done by David Hartcorn, will be on display. A slick coffee table book pairing both the paintings and photographs will be for sale, proceeds to benefit the local YWCA. Opening at 49 West Coffeehouse, Winebar & Gallery. This overlooks Penn Station in Baltimore, Maryland and I'm on it! A 52' high rotating art forum of Maryland artists. These are my pieces that are rotating in the mix. Baltimore LED Billboard. A few new pieces will be up in Annapolis, MD, @ Metropolitan Kitchen and Lounge, West Street. Come to the middle floor on Wednesday evening for the perfect mid-week perk, and see a handful of new paintings alongside of LAURA GALLAGHER and TIM MCCORMICK. I'm currently in the studio, (working moderately hard). New drawings and portraits coming soon! I'm also in the mood for a move.. open to suggestions. Come to the American Visionary Art Museum in Baltimore any time between now and October to see me working (with a fabulous crew of others) on the commemoration of our national anthem, in a colorful, cheeky sidewalk mural! Come after October, and the entire 300+ feet will certainly be finished, but beware- this will only last through fall of 2014. This is still on the AVAM sidewalk, and the city will be letting it stay! Here are some final photos, or come see it in the flesh (rather.. in the cement). The ever popular Sketchbook Project [endeavor of Art House] has made its way to Annapolis. Maryland Federation of Art is celebrating their 50th anniversary by creating a local chapter of the project. Books will be on display June 14 through August 2 at The Art Gallery, at University of Maryland College Park. Mine will be there! And then on to Brooklyn. 7 pm Friday November 9 2012. A book signing and illustration show at Atomic Books on Falls Rd in Baltimore. Ken Foster will be there signing his book I'm a Good Dog, and half of all the art proceeds will benefit B-More Dog, a positive pit bull advocacy group. I have one piece in the show, which is a collection of dogs doing good deeds and portrayed as upstanding citizens, one not to miss! Look for my painting of dessert treats (and wine) on the posters and program covers for the 2012 Chesapeake Bay Wine Festival at the Bay Bridge Marina, on lovely Kent Island. Chestertown Arts League Gallery "Showing Off"
I currently have two pieces up in beautiful Chestertown, Maryland (Roman Summer I and II- both receiving honorable mention for the show's "People's Choice" award). The CAL gallery exhibition is called "Showing Off", referring to a use of unfamiliar or "wild" new techniques of the artists choice. Nice looking show, no two are alike. April 6-28, 2012. Featuring the artwork of Stephanie Baker, Jimi Haha and Laura Gallagher. Listen all night to the soundscapes of Contra, the grooves of Subtle Hustle and more art offerings of the musical kind from Jimi Haha. Work will be up and available for purchase several weeks following Saturday's opening. Enjoy (seriously) specialty drinks and farm-to-table creative cuisine at The Metropolitan Kitchen and Lounge: 169 West St. Annapolis, MD. Select works (small and not so small) at the BBBistro in West Annapolis for the month of February. 112 Annapolis St. Shiny little things. OPENING RECEPTION First Friday, Feb. 4 from 5 to 7 pm. And there are eight Mankei Nekos in the works. Four real, four humans that may wish they were maneki. Done by March 16, new mural visible from US rt 50 in MD, check out Timmy O'Bryans pub. On the lookout for :: inexpensive cadmium green oils. Creative endeavors on the road! September 14 of 2008, a philosopher, photographer, a filmer and a painter set out to make more amazing things, and prove that America is not just a lazy box of hair. Perhaps you will find us in your neck of the woods- stay tuned. LiveWire, the venue-bar on River Street in Savannah! Works on narcissism from Stephanie Baker, Chris Bivens, Jennifer Dunlap, Liz Flores, Kathleen Kelleher, Charles Pate, Melissa Pellegrino, Will Penny, Lindsay Ryden, Megan Sherry, Pamela Stafford, Victoria Weygand and Lindsey Whitehurst! Mirror Image on view May 16 through 31. RECEPTION Friday the 16th, 7 pm! Carding begins afer 10! Street Circus Symphony will be making music! Silent auction begins at 7 pm, Thursday May 8 at 2427 Desoto Ave Savannah. Ends at 10. Music food wine. LOTS of GREAT pieces, variety of media! 41st Street between Whitaker and Bull. May's First Friday event is going to be larrrge. Seaworthy selections from Stephanie Baker- desotOrow Gallery April 24-30 2008. 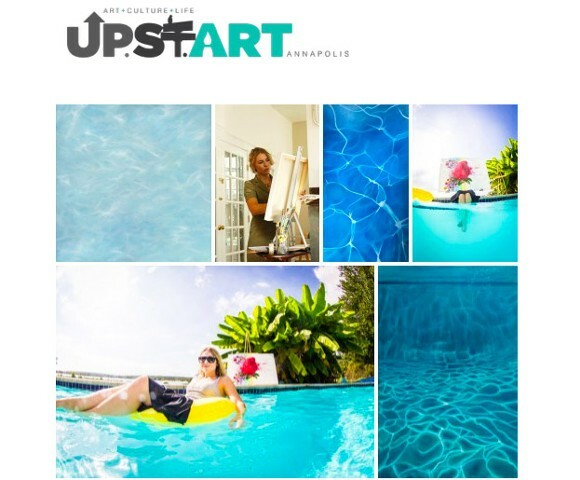 This is my show; a display of paintings, found objects and an underwater surprise. Reception April 25 at 7pm. Music, steamed crabs, and whatever else I can pull off.